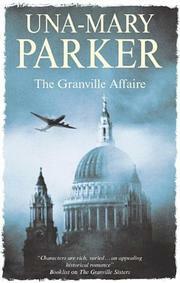 Scandals and World War II roil the high-born Granville family of Hartley Hall (The Granville Sisters, not reviewed) in British novelist Parker’s latest romantic fluff..
With the outbreak of German aggression in 1939, patriarch Henry Granville commands his brood of five daughters and wife, Liza, to ensconce themselves at the Scottish family seat for the war’s duration. However, the girls are irrepressible: Rosie, the eldest, is unhappily married to Charles, a rich and titled laird; caring for two children and living close to home, she is so impoverished and unfulfilled that she is ripe for an affair. Next in line is feisty debutante Juliet, also miserably married to a landed (homosexual) Scotsman, Cameron, who’s desperate for an heir; shuttling between the high life in London and depressing visits to her mother-in-law at Glenmally, Juliet does discover that she’s pregnant—not by Cameron, but by her dashing married lover, Daniel Lawrence. Louise, at 14, finds out after a visit to Brittany that Grandpa has an illegitimate son, Gaston, who appears to everyone’s horror at Hartley Hall agitating for his rightful position in the family. Moreover, enjoying her burgeoning sexuality, and lack of supervision, Louise is flirting dangerously with a young working-class evacuee from the London blitz, Jack Scovell, who loves—and impregnates—her. During the full-blown crisis of war, both Rosie and Juliet become nurses: Rosie embarks on her satisfying affair with the wounded Freddie, while Juliet proves her mettle to Daniel. And in order for any of these inconveniently adulterous partners to end up together, there has to be plenty of war carnage—the height of bad taste. American lawyer Salton Webb, however, appears as a symbolic savior and woos Rosie, while Louise settles on a more appropriate match, with a doctor, and the Granville family is altogether altered and improved by the war. A mindless series of familiar gyrations, offering readers exactly what they already know.